Even though iOS 8.1.2 released around one month ago, Apple has just released iOS 8.1.3 for the iPhone, iPad, and iPod touch that updated discovered the bug fixes, increased stability, and performance improvements within the OS. The updated that addresses a number of bug fixes including issue that prevented Apple ID passwords login for Messages and FaceTime, bug that caused Spotlight stop app search results, and issue that prevented multitasking gestures function on the iPad. 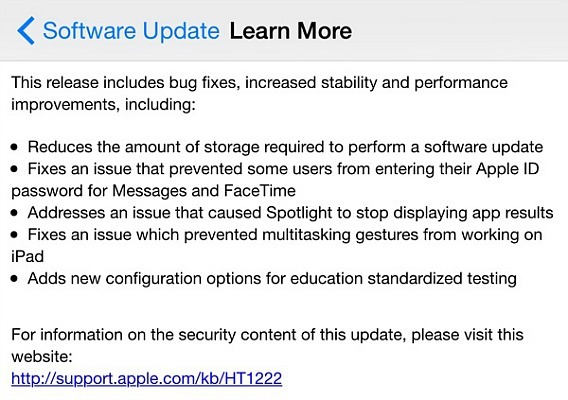 In addition, the iOS 8.1.3 also reduces the amount of free space required for software update and adds new configuration options for education standardized testing. Unfortunately, iOS 8.1.3 does not fix the recently publicized “GMT bug,” which causes calendar syncing issues and time zone confusion due to server syncing issues. 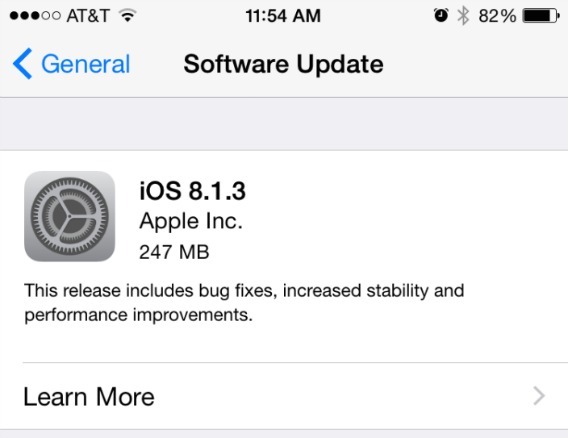 You can download and update iOS 8.1.3 right now on your iOS device, via Settings > General > Software Update. From there, hit Download and Install, and wait your iOS device complete update. You also can download and install the update through iTunes by plugging in your iOS device to PC. The download size of iOS 8.1.3 is 246MB. iOS 8.1.3 update is available for iPhone 4s, iPhone 5, iPhone 5c, iPhone 5s, iPhone 6, iPhone 6 Plus, iPad 2, iPad 3, iPad 4, iPad mini, iPad Air, iPad mini 2, iPad Air 2, iPad mini 3, and iPod touch fifth-generation. Apple has also released a 7.0.3 software update for the third-generation Apple TV, iTunes U version 2.1.1 for iOS with performance improvements, and released OS X Yosemite 10.10.2 for Mac.